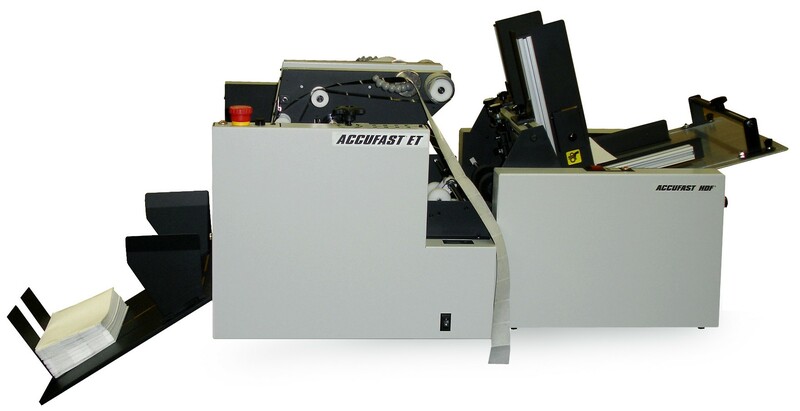 The ACCUFAST ET is a tabbing machine that has more uses than we have space to explain them. The essence of the ET is that it tabs both booklets and self mailers with the appropriate tabs in the correct spots automatically. Very little set up and operator interaction is required. Just select the correct Tab Mode, load the proper tabs, and feed pieces from whatever device you choose on the front end. Clean out the waste when it's full and splice on another strip of tabs when the first one runs out. Nothing to it. We've organized this presentation around the two major applications: Booklets and Self Mailers. The USPS defines a booklet as a folded mailer with a spine and some sort of device (staple or glue) to close the spine. The regulations require at least 2 and usually 3 one and a half inch tabs to close the booklet for self mailing. The specification for the location of the tabs is quite precise. Booklet tabbing is most often an off line activity. Typically a feeder such as the ACCUFAST FX or ACCUFAST HDF is used in line with the ET and the booklets are fed spine first into the tabber. Tabs are applied based on the tab mode selected at the start of the run. The location of the tabs is automatically set based on the size of the piece being used and USPS specification. Tabs are usually supplied to the ET in high volumes from a box of fan folded tabs located on the floor below the machine. This eliminates much of the handling of tabs. Just splice one stack of tabs to the next and run the whole thing, stopping for a few seconds occasionally to clear the waste paper spool. The self mailer is pretty much as it always has been save for the fact that either top or edge tabbing is allowed. The ACCUFAST ET does both with the twist of a knob. Because a self mailer often starts out as a single sheet of paper, the ET can easily become part of a mail production system that can include a paper folder, the ET, a transfer table and an ink jet address printer. All of these modules are available from ACCUFAST.